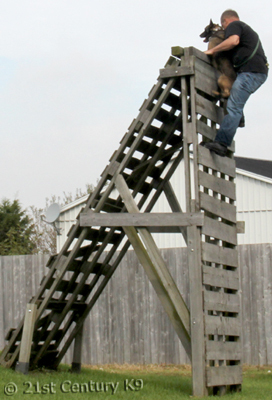 Advanced Dog Training, 21st Century K9, conveniently located near Windsor Ontario. We train all dogs. Level 2 Stability Classes are held Wednesday evenings at 7:00pm. Level 2 - Stability Training: Puppy to Adult dogs welcome. Length of course - Pay As You Go. Day and time - every Wednesday at 7:00pm. Price - $25.00 per dog per class. No pre-registration required. Classes run approximately 1 to 1 1/2 hours. Once you have completed Level 1 Basic Obedience you can take any Sunday morning class or Wednesday evening class on a pay-as-you-go basis. $25.00 per class. This allows you more flexibility and convenience to train your dog. Private Lessons are also available to further suit your needs. In Level 2, you will build on the basic commands you learned in Level 1 and learn a wider range of commands. You will learn more advanced communication between you and your dog and how to work your dog under natural and manmade stress. Come out to 21st Century K9 and view one of our Level 2 Stability Training Classes or participate in one of the Classes for free. The proof is in The 21st Century Dogman himself. Requirements: Level 1 must be completed prior to advancing to Level 2. Sturdy shoes - no sandals - and long pants must be worn for all classes. Cell phones are not permitted during class. All dogs must be leashed upon entering the property - before they exit your vehicle. All dogs must wear a flat collar and a minimum 6 foot leash. Equipment can be purchased at 21st Century K9. Note: Class is cancelled if the temperature reaches 85F/30C Degrees. Check the Current Temperature page if you're unsure of the temperature on a hot day. Family Members: Dog owners may share training with a friend or family member. One handler can work the dog one week and the other handler can work the dog the next week. Or, your can alternate during the class. Join our Facebook Page and keep up to date with events and happenings at 21st Century K9. Dogs of the Future for the Future. 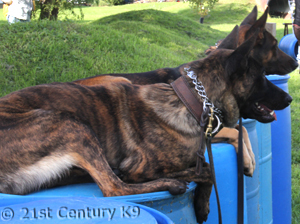 21st Century K9 is a Responsible and Reputable Breeder of the Dutch Shepherd Dog. Serving the communities of Windsor, Ontario, Lasalle, Amherstburg, McGregor, Maidstone, Essex, Harrow, Colchester, Kingsville, Cottam, Leamington, Tecumseh, Lakeshore, Puce, Belle River, Woodslee - all areas of Essex County, Kent County and the greater Detroit area.